Today i am going to share a home remedy for a healthy radiant glowing skin. Mostly known as a good source of Vitamin C, oranges are not only good for your health but also one of the most important natural skin-care products. Its toning properties improve your skin texture and colour. Both Vitamin C and citric acid in oranges restore collagen in your body. Collagen helps in skin-firming and prevents ageing of the skin. Citric acid helps to reduce wrinkles and softens the skin, giving you a much younger-looking skin. It exfoliates the skin, removing the dead skin cells, and cleanses the pores, helping in acne prevention. 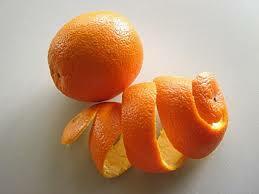 Oranges also have Vitamin A, which, along with Vitamin C, helps reverse sun damage, protecting your skin from cancer. It is also used in spas for skin polish as it improves the texture of your skin as it exfoliates and hydrates it well. So For This You Need..
We all know that orange is seasonal fruit, and getting a dried peel throughout a year is not easy. So for this, what you can do is.. whenever you have an orange. do not throw off its peel but keep it in a dry(non humid) place/sunlight to get it dried and solid in texture. Once you are able to get it, put the peel in the grinder..make a powder and you can store it in a tight container to use it whenever you want to..
Now take a sufficient amount of powder in a bowl, say about 1/2 tbsp. Add milk cream and honey to it, mix well. now apply this paste to your face and neck, leave it for about half an hour and wash it off. You can use this mask as often as thrice a week. Using this mask regularly will surely give you great results. I've personally used it, and it works really great. Try It and let me know your comments..
What You Are Crazy For?